By Scott Gilfoid: James “Chunky” DeGale (23-1-1, 14 KOs) will be emerging from a long 11 month layoff to defend his IBF super middleweight title title in December against an opponent still to be determined. DeGale wants to fight a unification match against WBC champion David Benavidez (19-0, 17 KOs) in 2018 if he’s still the champion by then. 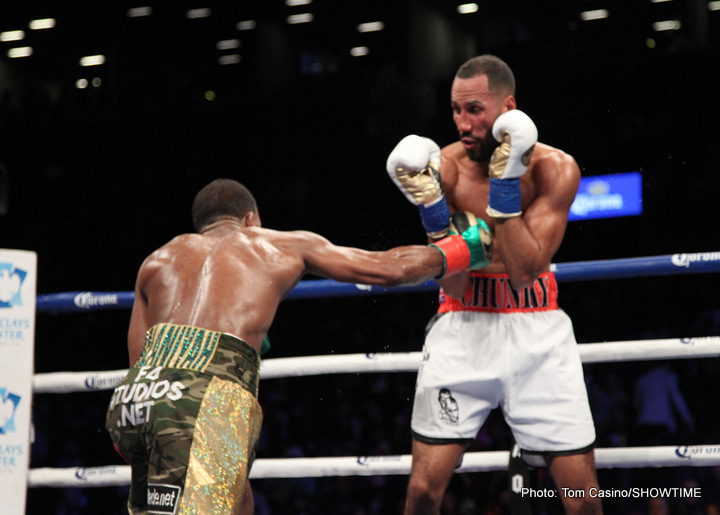 In DeGale’s last fight, he fought to a grueling 12 round draw against former WBC champion Badou Jack on January 14 at the Barclays Center in Brooklyn, New York. DeGale fought well in the first 6 rounds, but Jack came on strong to punish him in the second half of the fight. In the 12th, Jack knocked DeGale down. DeGale looked well beaten as the fight ended. During the course of the fight, DeGale lost his front teeth. It was reportedly DeGale’s false teeth. DeGale has already faced one mandatory challenger in Rogelio “Porky” Medina last year in beating him by a 12 round unanimous decision. With DeGale taking a unification fight against Jack in his last bout, it’s unclear if the International Boxing Federation will require that he face another mandatory challenger. DeGale would wind up having to fight Jose Uzvategui. That would case scenario for DeGale. Uzcategui can punch and is incredibly dangerous. ”December announcement in the next couple of weeks,” said DeGale on his social media site. DeGale is starting to look a little shop warn at this point in his career. If he faces a big puncher in December, I could see him getting knocked to oblivion. DeGale beat Bute, Medina and Dirrell, but he was hit hard many times by each of them. Those were not easy fight for DeGale. Dirrell almost beat him. The only reason DeGale got the nod in that fight was because of the 2 knockdowns he scored in the 2nd round. You take away those two knockdowns, and Dirrell wins the fight going away. DeGale can probably beat the young 20-year-old Benavidez when the time comes for them to face each other next year. Benavidez looked awful in struggling to defeat Ronald Gavril last month by a 12 round split decision on September 8 in Las Vegas, Nevada. Benavidez is still very raw and needs to make some improvements in his game before he starts fighting the likes of DeGale, Callum Smith, Chris Eubank Jr. or Anthony Dirrell. If DeGale’s promoter Eddie Hearn can get him a unification fight against Benavidez straightaway, he has a good chance of adding the WBC belt to his collection. That would setup a big fight between DeGale and the winner of the World Boxing Super Series tournament. It could be George Groves, Smith or Eubank Jr. Any one of those guys would be good for DeGale.